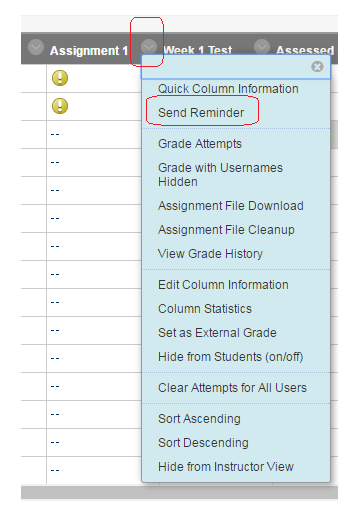 If you wish to manually add a score and feedback to a grade centre column you have created manually (i.e. not created automatically by a test or assignment), follow these instructions. 1. From your course Control Panel expand the Grade Centre menu and choose Full Grade Centre. 2. Find the column and corresponding row for the student who you wish to give a mark and feedback and hover your mouse pointer within the relevant cell and click on the action button. 3. Click on View Grade Details. 4. Enter the score in the Current Grade Value box. 5. Enter feedback in the Feedback to Learner box. 6. 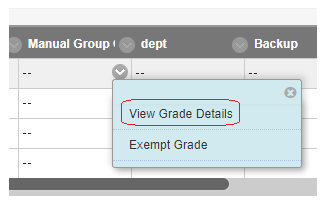 Anything you enter into Grading Notes will only be visible to users who have access to the Grade Centre within the course Control Panel. 7. Click on Save to save your score and feedback. If you have a Blackboard Assignment, Test, or Survey, you can send reminders to students who have not yet completed the assessment. Note this does not apply for Assessed blogs, journals, discussion boards, nor TurnItIn assignments. 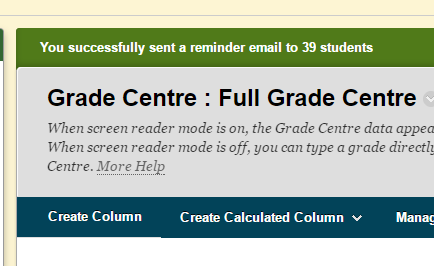 To do that you could use the email button above the Grade Centre instead. 2. Find the column for the Blackboard Assignment, Test, or Survey about which you wish to remind students who have not yet submitted. 3. Hover your mouse over the column name and click on the action button. 5. You will be asked to confirm that you wish to send the reminder and be told how many students will receive the email. 6. You will receive confirmation that the email will be sent. 7. The students will receive the email which will be in the format shown below. 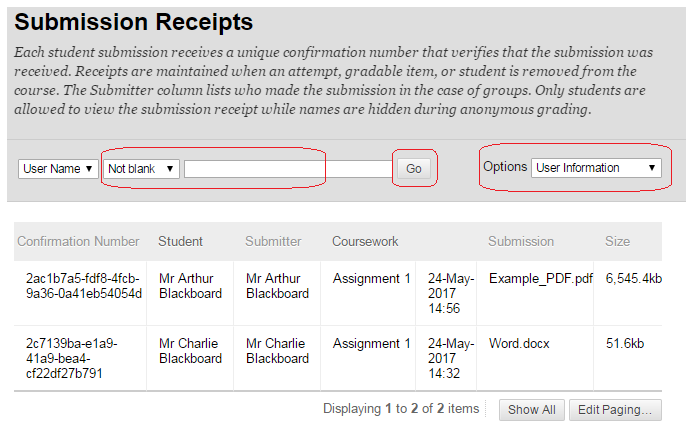 When students make a submission using the Blackboard assignment feature they receive an on screen receipt number. 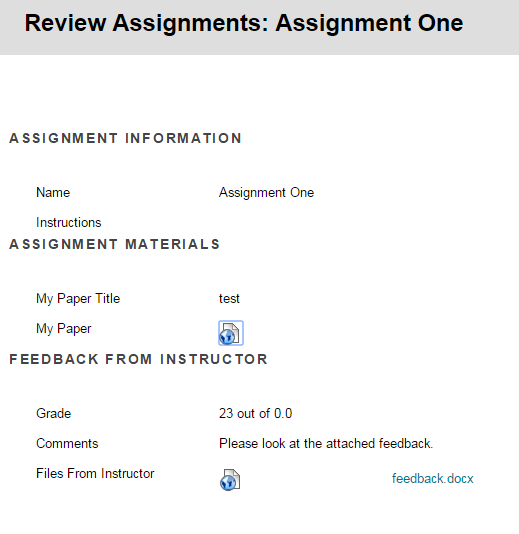 As an instructor you may view the student receipt numbers from submitted assignments. 1. 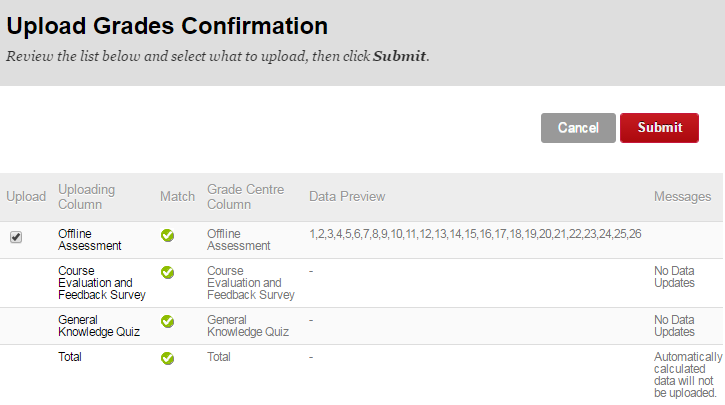 From your course Control Panel, click Grade Centre and choose Assignments. 2. Hover your mouse over the Reports button, and click on Student Receipts. 3. You can choose to search by user, or by receipt number. You may wish to search by receipt number if a student tells you their receipt number and you wish to verify it. 4. A simple way to see all the receipts is to set the Option to User Information, the second drop down to Not blank, leave the text box blank, and click on Go. You may upload files from an Excel file into Blackboard. Uploading marks from Perception? Follow this guide. 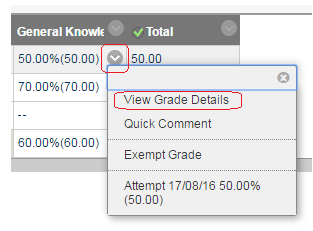 In order for Blackboard to know what column of your Grade Centre the marks are related to, you must create the appropriate column in the Grade Centre first. Then you can download an excel file from Blackboard which will add special codes to each column. 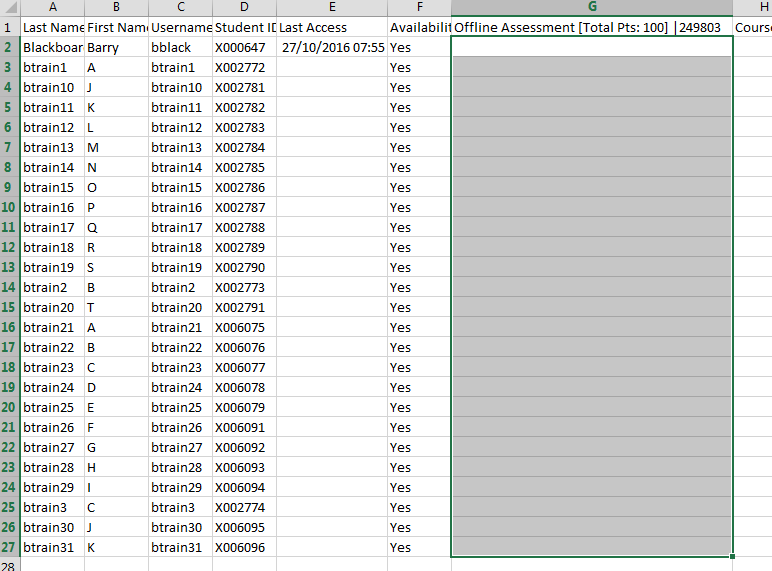 Having inputted the marks you can then re-upload that file into Blackboard, because it has the special codes it will be able to match the column in the excel file with the relevant column in the Grade Centre. 2. 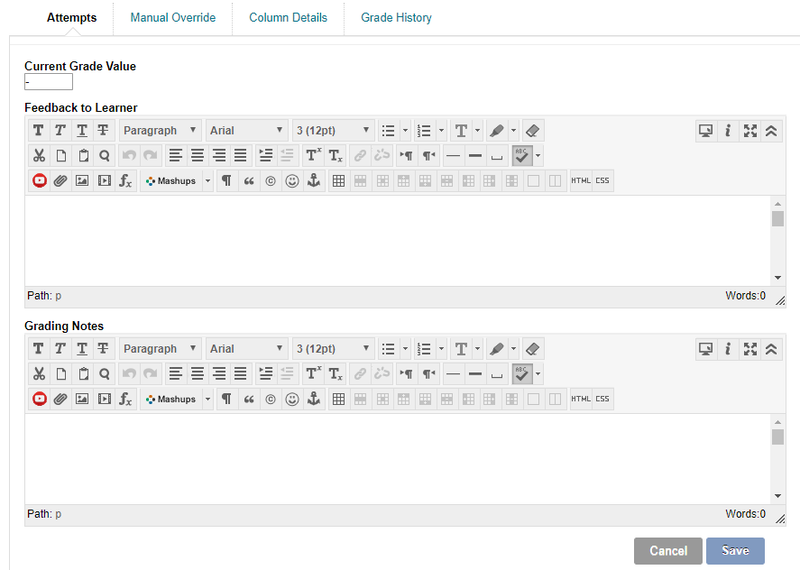 Create a column in the Grade Centre for the topic/assessment to which the marks are related. 3. In this example we have called it “Offline Assessment”. 4. Hover over the Work Offline button and choose Download. 5. Leave the options at the default settings and click on Submit. Note: if you have difficulty opening the excel file, you can change the delimiter type to Comma to receive a CSV file instead. 6. Click on Download and open the file in Excel. 7. If you receive this message click on Yes. Note: if you have difficulty opening the excel file, you can change the delimiter type to Comma in step 5 above to receive a CSV file instead. 8. In Excel enter/paste the marks. Ensure they are entered as numerical values, not formulas. 9. Save your Excel file as a CSV file. 11. In the Grade Centre hover over the Work Offline button and choose Upload. 12. Browse for your saved CSV file, select comma as delimiter type and click Submit. 13. You will be given a preview of the data that will be uploaded, click Submit to confirm. 14. The marks will appear in the column in the Grade Centre. There may be occasions where you wish to clear a student’s attempt. 2. 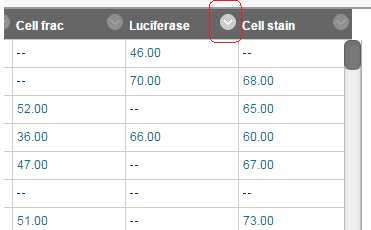 Find the cell in the Grade Centre where the student row and assignment/test column align. 3. Hover your mouse over the cell and click on the action button. 4. Click on View Grade Details. 5. Details of the attempt are shown. Click on Clear Attempt. 6. Confirm that you wish to clear the attempt. 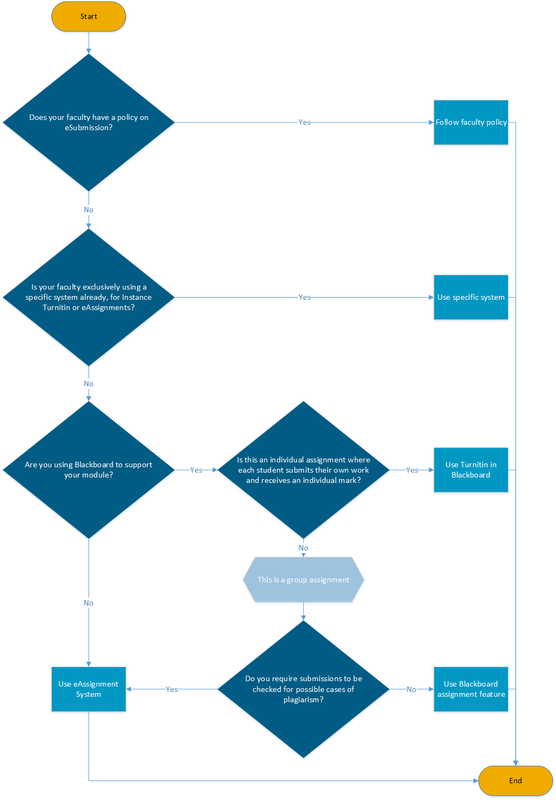 Which eSubmission service should I use? There are a multitude of possible methods to use to facilitate eSubmission. The most heavily used services are TurnItIn in Blackboard and the eAssignment service. This page summarises known issues and specific practical considerations regarding e-submission features in Blackboard. The new annotation screen has a number of known issues which are listed at the end of this detailed page. Empty Files are Submitted to Assignments for Microsoft Edge Users. When using Microsoft Edge, if a file that is submitted to an Assignment is open at the time of submission, an empty file is uploaded instead. This problem is isolated to occur when using the Microsoft Edge browser on the Windows 10 operating system. The vendor has notified Microsoft to correct the issue but do not have a resolution date at this time. – Do not open the source file after selecting it for upload into Blackboard Learn. Users should be advised to open files for inspection before accessing the area to which they wish to upload the file. – Use a different browser such as Chrome or Firefox. When submitting Excel files, students may experience difficulties due to issues with their file. 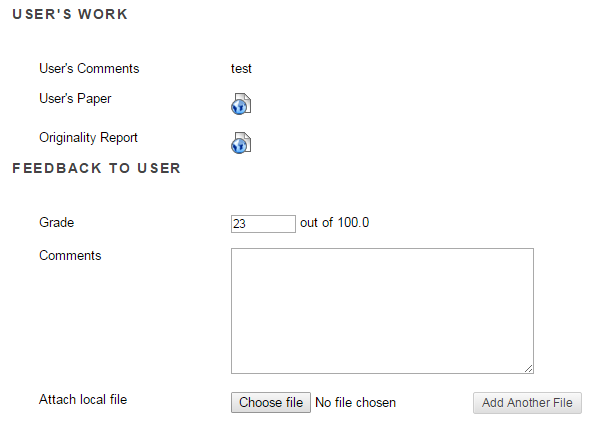 Tables / graphs / images pasted into Word / Open Office documents may be rendered incorrectly in the Turnitin online viewer. Students are advised to save and submit their work in PDF format when submitting to Turnitin to avoid this issue. 1. 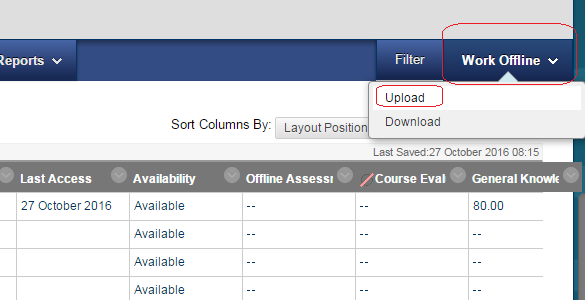 From your course’s Control Panel, expand the Grade Centre menu and choose Full Grade Centre. 2. Find the row and column that corresponds with the student in question and the assignment. 3. Hover your mouse pointer within the cell to reveal the action button. 4. Click on the action button. 5. From the menu that appears click on the attempt to which you wish to add a feedback file. 6. You will see the students attempt. You should see the mark you already gave in GradeMark. 7. Under the Feedback to User section, you can now add a comment (e.g. please look at the attached file), and then attach a file to give back to the student. 9. You are returned to the overview screen of the student’s attempt for this assignment. 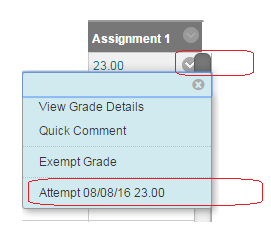 You can click on Grade Attempt if you wish to go back and change the feedback. How a student would view the feedback file. 1. 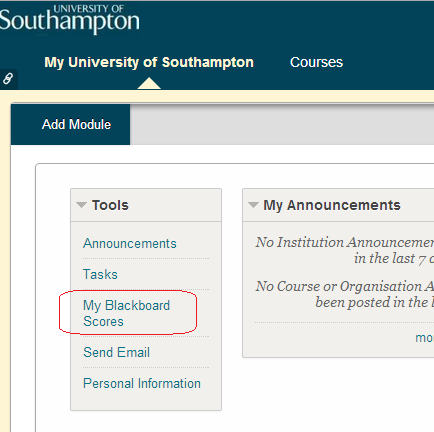 Click on My Blackboard Scores from the My University of Southampton page within Blackboard. 2. Find the course concerned. 3. Find the assessment concerned and click on the name of the assessment. 4. The feedback is shown along with the attached file. 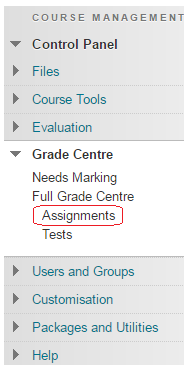 If you wish for students not to see scores for assignments you can set the Grade Centre not to show those scores. Then when you are ready for students to view their scores you can reveal their scores to them. 1. From the Control Panel click on Grade Centre and then Full Grade Centre. 2. 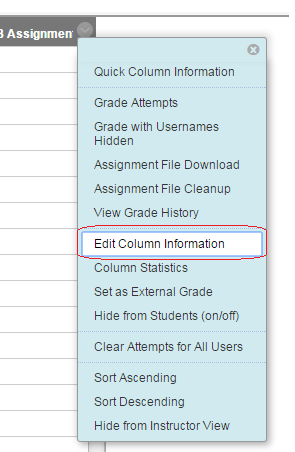 Find the column for your assignment and hover your mouse over the name of the column and click on the action button. 3. Click on Edit Column Information. When set to No the values in this column will not affect calculated columns, such as the running total. If you do not wish students to view these scores ensure this is set to No. If this option is set to Yes then students can view the scores. Set this option to No and students will be unable to view these scores. 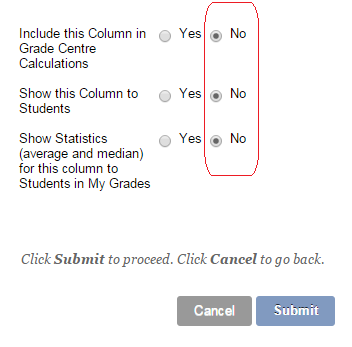 If wish for students to be able to compare their score with the class average and median, set this option to Yes. 5. If you wish for students to be unable to view any scores, set all of these options to No and click on Submit. 6. Once you have entered all scores and wish for students to view their scores repeat the above steps and set the options in step 4 above according to your preference and click on Submit.